Last but not least: Coach GVWR | SuperSprings® International, Inc. I know what you’re thinking and the answer is no, “GVWR” is not some hip way to imitate the growling sound a lion makes in a text message. So, then, what is it? How does it relate to finding the proper SumoSprings for your Class A Ford F-53 motorhome? The innovative top bracket for the front SSF-17 SumoSprings Rebel series allows the SumoSprings to be installed without any drilling on 2008-2018 Ford F-53 Class A applications. The design of the rear SumoSprings Maxim kit leaves no void between the frame and the axle, which allows for constant engagement, helping to significantly reduce sway. Damping properties inherent in SumoSprings translate into reduced internal noise and vibration. In the quote below, Jeff mentions the difference in “tail wag” (sway) and the smooth controlled handle of the ride after installing SumoSprings. “I am very pleased with the performance! The tail wag is gone. I let my brother drive the return trip and he described my motorhome as the best handling motorhome he has ever driven!” – Jeff, Motorhome owner, SumoSprings enjoyer. 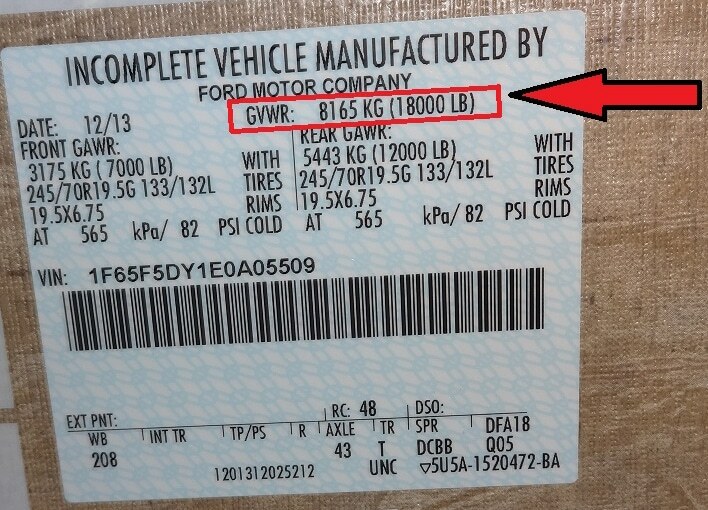 The Coach GVWR (Gross Vehicle Weight Rating), not to be confused with GAWR (Gross Axle Weight Rating), or the GVCR (Gross Vehicle Combined Rating), is the maximum operating weight of a vehicle specified by the manufacturer (Ford). The Coach GVWR is usually found on a label inside the vehicle’s door frame. Most manufacturers will also publish this information online. How can you use this information to find the correct SumoSprings part numbers for your Coach? It’s as simple as 1, 2, 3! 2. 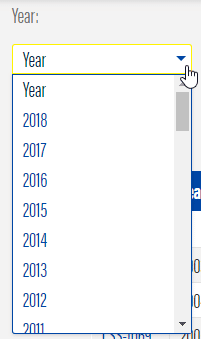 Using the drop-downs, select the year of your Ford F-53, followed by the Coach Make and Coach GVWR. There is no need to select Make: Ford, or Model: F-53. 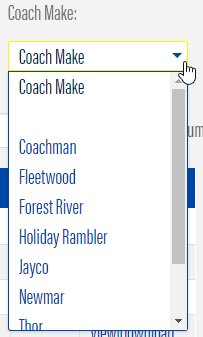 Once you select Coach Make, the table will know you own a Ford F-53 motorhome. 3. Learn more, view images, or submit an order by clicking on the part numbers! You can use the “Column Visibility” eye button to hide and show only the columns relevant to you. Print or PDF the table to share it! In step 2, notice the amount of repeated information. What is not seen in the screenshot, is that information continues for 4 pages. 4 pages of not only the same repeated part numbers, but also different part numbers related to different GVWR classes and different Coach Makes. 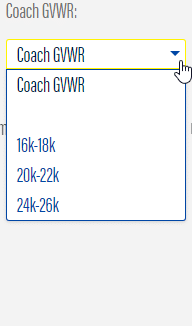 As seen in step 3, once that vital information (Coach Make and Coach GVWR) is selected, the interactive guide narrows down the available part numbers, making it nice and easy to find the necessary information you are looking for. Locate the label on your Coach and find out what the GVWR is. Once you have that, there’s nothing stopping you from trying SumoSprings!